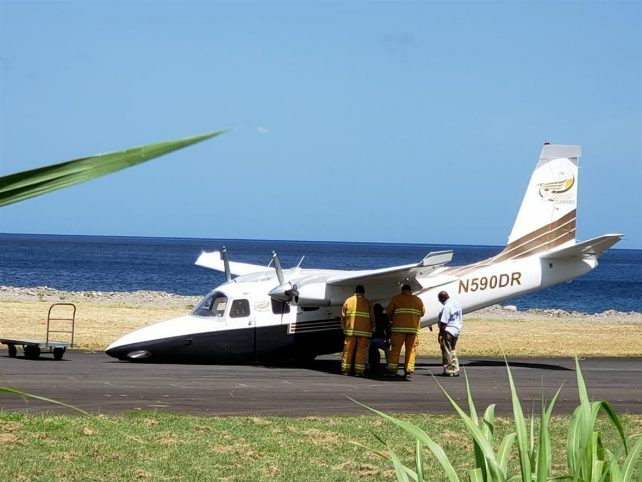 (DOMINICA NEWS ONLINE) – Chief Executive Officer (CEO) of the Dominica Air and Seaport Authority (DASPA), Benoit Bardouille has said a mishap involving a small plane at the Canefield Airport on Friday morning is being investigated. The plane, registration N590DR, experienced a nose gear collapse at the airport at about 9:33 am on arrival from St. Thomas. “Apparently the aircraft nose gear failed causing the aircraft to drag before coming to a complete stop on the runway,” he said. Caribbean Civil Aviation Authority was notified of the incident and they will carry out their own investigations. According to Bardouille the aircraft is now parked awaiting investigators. Five passengers and one crew member were aboard the plane when the incident took place.